Lot Detail - CALVIN COOLIDGE- Unusual "Souvenir Prize Ticket Number 1/Baseball game/Police versus Firemen"
CALVIN COOLIDGE- Unusual "Souvenir Prize Ticket Number 1/Baseball game/Police versus Firemen"
Document signed by Coolidge as a fund raiser for the Home Defense League. 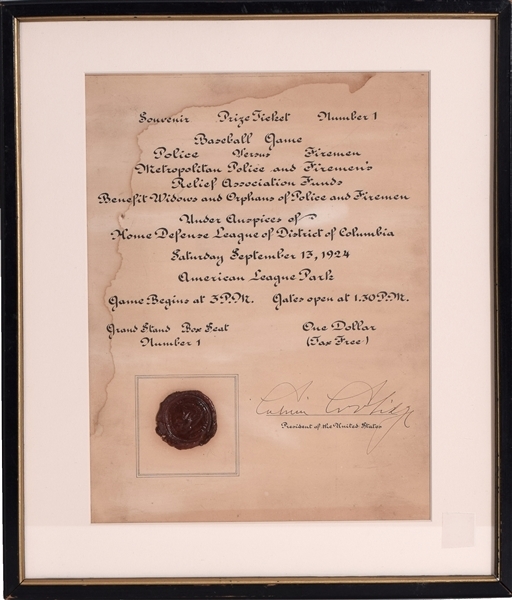 "Souvenir Prize Ticket Number 1/Baseball game/Police versus Firemen...Home Defense League of Washington, District of Columbia/Saturday, September 13, 1924/American League Park..." On cream color paper with red wax presidential seal. - Sight size as matted, 10 1/2 in. x 7 3/4 in. It interesting to find anything related to baseball and Calvin Coolidge, which as president hosted the 1924 Washington Senators which are generally believed to be the first title-winning professional team to visit the White House.